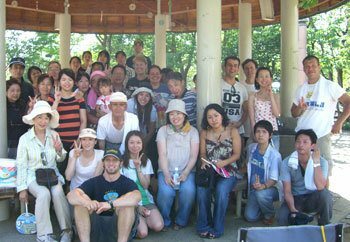 From all of us teachers here at Smiths School of English I would like to once again say “Thank you” to all of our wonderful students who took the time to join us at our 2008 Smiths School of English BBQ Event at Tsurumi Ryokuchi Park on July 27th, 2008. Many of our students traveled from far to join this event for example Nara, Kobe and Shiga and we appreciate it very much! Thank you to the students who took some of the pictures we have used for this site and a special thank you again to Mr. Yoshihisa Matsushita from Smiths School of English Tsukaguchi who took the time to prepare a DVD with film and pictures of the event! 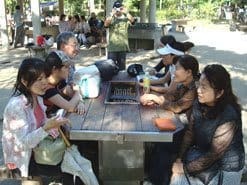 It was a hot day but we enjoyed delicious food, fun English games, seeing friends again from other Smiths School of English schools in Kansai and much chatting and laughter! 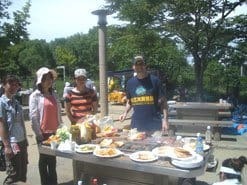 I would also like to say “Thank you” to the wonderful staff at Tsurumi Ryokuchi Park who made sure that our BBQ area was prepared for us when we arrived and explained to us how to use the gas grills. 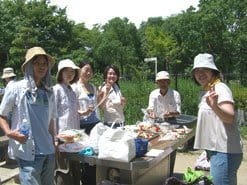 Tsurumi Ryokuchi Park is a wonderful place to enjoy a summer BBQ as well as many other beautiful surroundings! ​Finally, I would like to say “Thank you” to the following Smiths School of English franchises which helped to plan the event! 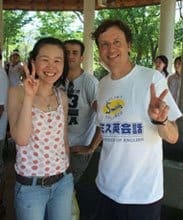 Hi Alex!Thank you for organizing such fun BBQ event yesterday! I enjoyed meeting other students from another Smiths School of English schools. Also, it was fun to meet some students which I met at hanami party again! 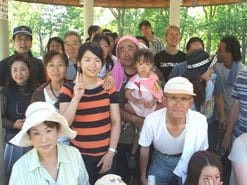 It’s making new friends for me!This event was very hot but very fun and I enjoyed much good food.See you again soon! Alex,This was my first time to join a school event and I enjoyed the BBQ very much! It was so hot at Tsurumi Ryokuchi Park but it seems everyone enjoyed because everyone was smiling!I enjoyed meeting fellow Smiths School of English Fuse students and various other students from Kansai Smiths School of English branch offices!Thank you Alex and other Smiths School of English teachers for planning this BBQ Party! Dear Alex,Thank you for another fun event for Smiths School of English students. 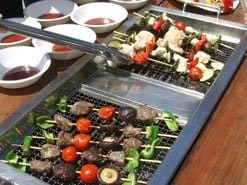 I and my friends enjoyed the event very much!Thank you for making very delicious kebabs for us to enjoy! 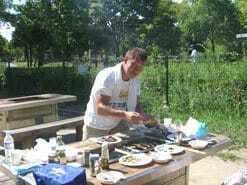 You are a good cook!I enjoyed seafood kebab and miso dengaku nasu which you made very much!Thank you for getting good BBQ place at Tsurumi Ryokuchi Park.You said you reserved 2 months ago!! Wow!Thank you for planning so hard! Hi Alex,Thank you for a fun event again! I always enjoy Smiths School of English event. I attended various events and its always fun and can meet many people! Hi AlexYesterday, we enjoyed BBQ very much!My friends said first time, she worried enjoy BBQ because she can't speak English but teacher's very friendly and many good students!She said Alex made roasted boar very delicious and after long time, she have a very quick mind for English games. Very fun!We had a nice time. Thank you Alex and teachers!Have a nice day! Thank you very much! Hi Al,Thanks for throwing such a fun BBQ.I had a wonderful time. I was happy to get to know various people.The meat was very delicious and tender. I'm sure that we all students are fascinated by your character.I hope you keep having meeting in the future.Lastly I thank your wife and wife's niece for cooking to us under the flaming sun. ​Masafumi,Thank you for the kind comment. We will most certainly continue to have such events in the future, so please attend next time too. 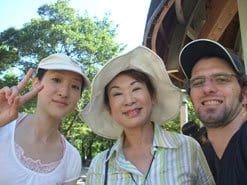 I will pass your appreciation to my wife and her niece.It was certainly a hot day and I will most assuredly be the head cook next time as I have earned it.Let's continue to enjoy English and good times! I would like to thank all who joined our joint barbecue event, those who helped out with the food preparation and those who gave me comments in writing. This event was a great success. Smith’s School of English Tsukaguchi School brought the food for its group, which consisted of hamburgers, an onion dip and fruit. I enjoyed cooking hamburgers for my school’s group! thank you for reading our barbecue page! Hi!! Everyone who went to Tsurumi BBQ party. That was a nice barbecue party, I felt. For me it was a good experience that I could participate in the party wonderful teachers held at Tsurumi Ryokuchi Park and I could eat barbecue food foreigners made and cook.It was a very hot day and I was taking movies, so I can hardly remember the barbecue food that I ate.But I made a nice DVD of the party. If you want it, please tell it to your teacher of your school. So you can enjoy it.Let's meet at next event. 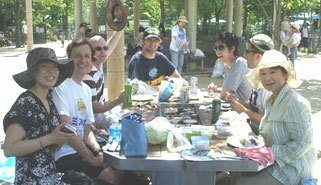 ​I joined the Smith’s BBQ party with my family.I looked forward to it because we had never experienced it.It was held in Tsurumi Ryokuchi Park that was a huge, clean and wonderful place.Smith’s teacher, Derek was a good cook. The hamburgers that he cooked were delicious.After lunch, I had a good time playing games and chatting with some teachers and students. It was a great party as we had expected.I appreciate the Smith’s teachers planning this enjoyable event.I hope that this enjoyable event will be held again. I do want to join it. 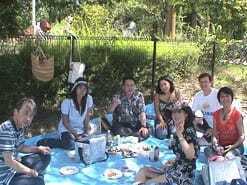 I went to BBQ party with Smith English School students. I could play many games and spoke English. Very enjoy day.A.K.私はスミス英会話教室の生徒と一緒にバーベキューパーティーに行きました。私は沢山のゲームし、英語を話しました。とても楽しい日でした。A.K.